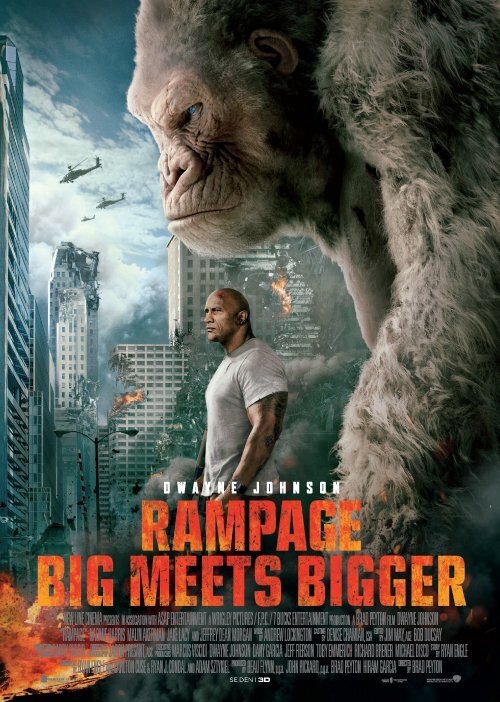 "A Movie So Bad, It’s Bad"
RAMPAGE is about three animals, infected by a pathogen, who have grown to immense sizes and become hostile, and a primatologist who must stop them before they level Chicago. Despite some exciting action in the second half, RAMPAGE is a terribly written story, with mixed messages, too much foul language, and some violent, gory images. RAMPAGE is a Dwayne “The Rock” Johnson starring movie inspired by the video-game of the same name that was popular in the 1980s and 1990s where giant animals wreak havoc on cities. The movie opens on a space station where a group of scientists are doing experiments and testing. Everyone on the space station is dead except for one female scientist because the experiments they were doing resulted in a rat growing in size and viciously killing everyone else. The scientist barely escapes into an ejection pod with canisters of the pathogen they were testing, but damage to the pod results in her death. The canisters enter the atmosphere and land in various parts of the United States. Meanwhile, Davis Okoye (Dwayne Johnson), a primatologist and former Special Forces soldier, helps take care of the gorillas at the San Diego wildlife conservatory. His best friend is a rare albino gorilla named George, whom he saved from poachers in Africa and has taught to communicate through sign language. George is protective and has a twisted sense of humor (taught to him by Davis obviously). That night, one of the canisters from the space station lands close to George and infects him. The next day, Davis sees George has grown significantly bigger, and is showing signs of intense aggression, including killing a grizzly bear. What they don’t know is that two other canisters landed in the U.S., infecting a wolf and an alligator. The owner of the pathogen is a corporation using genetic editing under the guise of researching a cure for cancer, but instead creating weapons of mass destruction. Davis is approached by a woman, Dr. Kate Caldwell, who informs him she works for the Energyn, the company that created the canister, which is run by two siblings, Claire and Brett Wyden. In reality, Kate was fired from the company for trying to stop the Wyden’s evil plans. Before Davis and Kate are able to do anything, they’re captured, along with George, by Harvey Russell, a government agent working for some secret agency called OGA. Soon after, the Wydens turn on a radio frequency from their skyscraper in Chicago that will call the three monsters to Chicago. Why would they do something like this? Who really knows? Since George was infected, he’s grown hostile and violent, and Davis can’t stop him. With the three beasts terrorizing Chicago, can Davis and Kate stop them before a military commander decides it’s best to level the city with a bomb? The most shocking thing about RAMPAGE is that it had four screenwriters who didn’t see the problems with all the illogical inconsistencies in the movie. There are so many questions and disturbing fallacies surrounding the movie, it’s hard to ignore them even if you’ve turned your brain off while watching. For example, why should viewers feel so worried for the gorilla’s life when literally thousands of people are being eaten and torn apart all around him, and at his own hands? Why would an evil corporation even make giant animals, when the cure for cancer is right at their fingertips and would be far more profitable for the company? How does an army commander have the authority to drop a major bomb on a US metropolitan city, and how is that even a good idea? Finally (but we could continue), why was the evil corporation doing their tests in space in the first place? Beyond RAMPAGE’s atrocious story, the dialogue is laughable, and none of the characters really find their footing. The only upside is the movie’s exciting second half, which is nonstop monster action and has some genuinely tense moments. The computer animation in RAMPAGE is also impressive. This, however, isn’t enough. Filmmakers don’t have to trade a decent story for giant monsters. Movies like the recent KING KONG thriller, PACIFIC RIM and JURASSIC WORLD prove that. The filmmakers behind RAMPAGE were just a bit too lazy. RAMPAGE has some light positive moral messages about protecting people and being good stewards of animals. However, there are also some politically correct, environmentalist, anti-capitalist, anti-human elements involving greedy and bloodthirsty capitalists. The movie also contains silly caricatures of arrogant military commanders. Finally, RAMPAGE contains a slew of obscenities and profanities, along with some violent and gory images. MOVIEGUIDE® advises extreme caution for RAMPAGE. You will want to save your time and your money. Some law breaking by the heroes results in saving Chicago, and there’s some lying. RAMPAGE is inspired by the video game of the same name that was popular in the 1980s and 90s. Dwayne Johnson plays Davis, a primatologist whose best friend is George, an albino gorilla he saved in Africa from poachers. George is infected by a pathogen that makes him much bigger and hostile. So, Davis must try to protect George, as well as the people whom George might hurt. Two other animals, a wolf and an alligator, are also infected and are headed toward Chicago. RAMPAGE is terribly written, with awful dialogue and plot holes you could write a book about if you so desired. The action is sometimes fun, but none of the actors really find their footing. RAMPAGE has some positive moral messages about protecting people and being good stewards of animals. However, there are also some politically correct, environmentalist, anti-capitalist, anti-human elements. The movie also contains silly caricatures of arrogant military commanders. Finally, RAMPAGE has a slew of obscenities and profanities, plus violent and gory images. MOVIEGUIDE® advises extreme caution. You will want to save your money and your time.